Can Fit in a Bottle of Ghee? Ghee is a semiliquid form of butter from which the water and milk solids have been removed by heating and straining. Since ghee is 100% fat (approximately 14 grams per tablespoon), and since high-fat diets are known to increase the risk of coronary heart disease, I was surprised to see an ad promoting ghee as a health food. The ad pictured below was distributed in 1998 by Maharishi Ayur-Ved Products International, a prominent marketer of ayurvedic products. 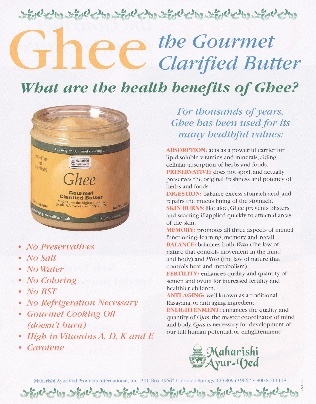 The ad states that, "For thousands of years, Ghee has been used for its many healthful values." That statement is literally true because ghee is an Indian folk remedy. But whether eating it promotes health is another story. The product retails for $7.95 for 13 ounces or $12.95 for 28 ounces, which is much more than the cost of ordinary butter. To investigate, I used PaperChase to perform a Medline search for the word "ghee." This yielded 45 citations, 30 of which were accompanied by abstracts that could be read online. Four studies noted an association between the use of ghee and increased prevalence of coronary artery disease [1-4]. Another report -- from 1978 -- stated that when food is well chewed and the diet contains plenty of vegetable fibres and fermented milk products such as ghee and yogurt, the amount of salivary mucus that is swallowed will increase, which can help protect against peptic ulcers. However, with modern ulcer treatment available, there is no reason to believe this potential benefit outweighs the increased risk of cardiovascular disease. The rest of the studies did not appear relevant to the claims in the ad. The right-hand column of this ad makes the following claims. Enhances the quality and quantity of Ojas, the master coordinator of mind and body. How likely do you think it is that these claims are true? What kind of evidence do you think would be needed to substantiate them? Do you think the evidence exists? Singh RB and others. Association of trans fatty acids (vegetable ghee) and clarified butter (Indian ghee) intake with higher risk of coronary artery disease in rural and urban populations with low fat consumption. International Journal of Cardiology 56:289-298, 1996. Lip GY and others. Dietary fat purchasing habits in whites, blacks and Asian peoples in England. Implications for heart disease prevention. International Journal of Cardiology 48:287-293, 1995. Sasaki R and others. Case-control study on breast cancer in Madras, India: finding on diet, reproductive factors and anthropometric measurement (Meeting abstract). Japan Journal of Cancer Research 7:708, 1995. Jacobson MS. Cholesterol oxides in Indian ghee: possible cause of unexplained high risk of atherosclerosis in Indian immigrant populations. Lancet 2(8560):656-658, 1987. This article was posted on September 18, 1998.